Egg Bites Moulds 2 PACK for Instant Pot QT5, 6,8| Included Starbucks Sous Vide Egg Bites recipe and our recipe book download! 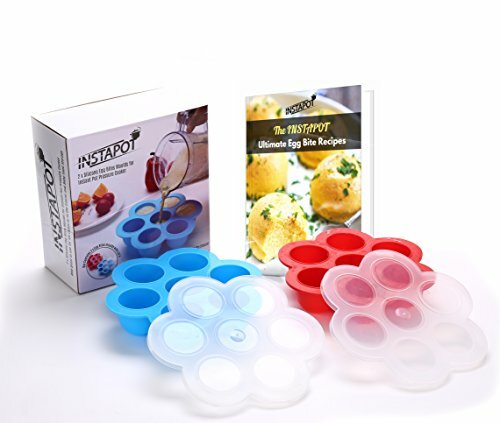 Why not try silicone egg bite molds to make your favourite Egg Bite Snack? Egg Bite Molds supports a better and easier way on healthy diet. If you're trying to eat less carbs or counting calories, then these molds are a perfect way to start the day. Try these - we were hooked after the first bite of our Sous Vide Egg Bite Recipe! They were warm and delicious, and they are super healthy too! With next to no carbs and packed with protein. But unlike Startbucks, once you have this product they are inexpensive too - unlike Starbucks, who charge $5 for two tiny bites! Egg Bites are perfect for those on Weight Watchers or Who wants to keep healthy, it takes a little time making food using instant pot. They are easy to use and your Instant Pot can help you create these delicious Egg Bites! Other combos to try; Diced Green Chilis + Pepperjack Cheese Cooked Broccoli + Cheddar Cheese Bacon + Gruyere Cheese Sausage + Mushrooms + Swiss Cheese Sun Dried Tomatoes + Basil + Feta Cheese Made from high quality FDA approved food grade silicone. 7 individual portions: You can put different tastes of your food and enjoy more choices Lid can isolate the bacteria in the air and seal tightly to protect fresh original taste of food, Silicone is naturally bacteria, odor and stain resistant Tray and lid may be used in the freezer, tray may also be used in the microwave and the oven (up to 425 F) used for baking, for food storage or serving, or as a mold. Reusable: The non-stick flexible silicone and the wider, round cubes enables you to release portions individually or as many as you need without disturbing the other cubes. Just squeeze the bottom of the cube and the portion pops right out! Egg Bites Moulds 2 PACK for Instant Pot QT5, 6,8| Included Starbucks Sous Vide Egg Bites recipe and book. If you have any questions about this product by Instapot, contact us by completing and submitting the form below. If you are looking for a specif part number, please include it with your message.